Remember how, during last year's municipal election in Toronto, supporters of Olivia Chow and progressive activists and organizations warned that John Tory, were he to be elected as Mayor of Toronto, would simply be a more effective version of Rob Ford? How we were told his agenda would represent the Ford agenda without the antics, drugs and buffoonery? John Tory, on the other hand, would be able to cobble together the votes to pursue an agenda favoured by Bay Street – including privatization and outsourcing. His endorsers include antilabour heavyweights such as Case Ootes, Ford’s former campaign manager Nick Kouvalis, and a smattering of Liberals among a solid core of Conservatives. If Tory were elected, it would boost the political fortunes of both the provincial and federal Conservatives, and be a real step backward for the people of Toronto. I think there is a lot of truth to this position (although many of Chow's online partisans frequently would predictably overstate their case) and said as much when interviewed by the Toronto Star during the election in an article in which I said people should reject strategic voting (though not necessarily support Chow). 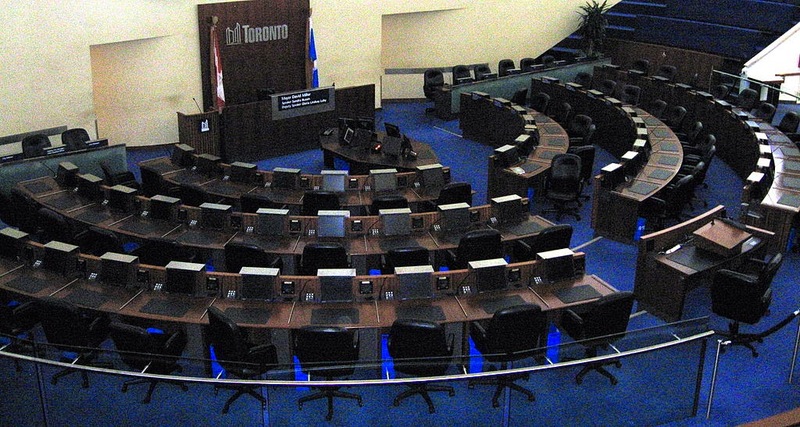 There is, without any doubt an austerity agenda at work at Toronto City Hall, and Tory's politics embody that agenda. And yet, when Tory's first budget recently was presented to council, it was passed by a vote of 42-2. The two dissenting votes on the budget on council were from Rob Ford and Giorgio Mammoliti, who are firmly on the council's far right. The other 42 votes were "cobbled" together, in the end rather easily, from across the alleged political "spectrum", encompassing those seen as on the right like Denzil Minnan-Wong, and those perceived as on the left like Mike Layton. Every single Councillor endorsed by the very same Labour Council whose newsletter was quoted above, voted for Tory's budget. Every single Councillor associated with the Liberals or NDP (technically there are no parties in Toronto politics) voted for Tory's budget. All the electoral rhetoric aside about how catastrophic Tory's agenda would be for the city, its labour movement, workers, those living in poverty and so many others, Tory's budget faced no serious opposition from the left or from "progressive" Councillors. While the budget (this time) is not as terrible as some might have anticipated, it remains a budget firmly rooted in austerity and right-wing premises. For example, it contains an annual property tax increase on the average Toronto home of only $83, a figure that is lower than the recent $93 annual TTC Metropass fare increase for transit users, which is a truly telling and shocking fact. While some Councillors did call for higher tax hikes in the lead up to the budget, opposition to the fundamental premises of Tory's budget would be most kindly described as muted at best and perhaps more accurately described as basically non-existent. There were no calls to scrap the fundamentals of the austerity, anti-tax, pro-car framework that this budget exists in. No calls for anything like, for example, ending user fees for city programs, for placing surtaxes on the homes of the wealthy or for the implementation of a truly progressive municipal income tax or for any number of other more transformative ideas that leftists once advocated for. In other words, there was no significant and vocal opposition from what the public would see as a left perspective. Ralph Miliband, the great British Marxist thinker, once wrote, in a quote I frequently cite, that "one of the most important aspects of the political life of advanced capitalism is precisely that the disagreements between those political leaders who have generally been able to gain high office have very seldom been of the fundamental kind these leaders and other people so often suggest". This is more true now than when he wrote it in 1973. This fetishistic desire in Toronto politics (as well as, in different ways, more broadly in Canadian politics) for "consensus" and the idealization of the false god ideal that politicians should somehow "work together" to get "things done" both ensures that the administration of bourgeois, day-to-day austerity politics will continue as a given and is ultimately self-defeating for the left and progressives especially. A lack of vocal and consistent opposition to Tory from the start of his term has already begun to cede the ground, again, to Ford positioning himself as the lone voice against the political establishment and as, therefore, the populist representative of the "common people". He was seen as such by many whose class and economic interests he actually actively worked against. By embracing both the framework and, as I have argued in the past, the language and logic of the austerity consensus, "mainstream" left politicians help to enable this. They are widely perceived, and not without justification, as a part of a political establishment that many people feel is very distant from and unconcerned with their day-to-day struggles and realities. This situation explains why, again as Miliband put it, "large numbers of people among the public at large, despite the political rhetoric to which they are subjected, recognize...‘politicians are all the same’". This reality of often active collaboration between the mainstream left and the right in the administration of austerity, neo-liberal and bourgeois government, as well as the acceptance of all of the essential elements of capitalism and capitalist "parliamentarianism" as a given and fundamentally unalterable reality, highlights, more than ever, the need to build new and truly anti-capitalist left political forces and parties. These could include, for example, a Left Front municipally in Toronto, and would, as other movements and parties are doing in Europe and elsewhere, reject the austerity consensus and neo-liberal politics entirely and work actively and vocally in opposition to them both during elections and if elected. Roti or Naan Bread Pizzas: Fast & Fun! Why not make Ontario's Beer Store public?